Open Your Heart and Allow More Space For LOVE! Believe it or Not Most of what we are teaching and sharing is Science Based. Today humanity is measuring the immeasurable. Heart Disease is the #1 killer disease of both men and women, not cancer. The heart is the central communication center of every single cell in the body. Cancer is the dis-ease of the cell. If we solved the issues of the heart we could solve all dis-ease!!! Stop standing still and doing the same thing over and over again expecting something different. It is time to open the space in your heart and learn how valuable you truly are! You are the most beautiful priceless diamond and there is nothing more valuable then YOU! Find your S.E.L.F. The Source Energy Love Frequency within You! Your most valued asset,Your SELF! What does it mean to “Defrag Your Heart Drive”? The fragments that take up your heart space are the discordant energies we hold on to and continue to repeat over and over again never really having the opportunity to experience an even better way to be in this world. Defragging your heart drive allows those discordant fragments to be neutralized and released so that your heart becomes more opened to allow more space for harmonious energies. This helps you release the attachment to that which no longer serves you or to other people’s stuff. This allows you to be free to be more of who you truly are! What happens when you go from “Fragmentation to Wholeness”? February 17, 24 & March 9, 16 – 2016 Live! Create Your Gifted Account Now and Click Here! Take an adventure into your heart and discover YOU! For More than a decade, Julie, has been exploring the gifts the diamond brings us and how it relates to spiritual development as human beings. Julie resides in South Africa and England. She is traveling to the United States and sharing her discoveries and wisdom about the Diamond Light World. Julie shares that the diamond reconnects you with the very heart of your essences and to allow that to be your navigator. Your diamond is the heart, the love, the joy, courage, wisdom, and a deeper knowing of your own Soul. Flowing through the grand universal diamond grid is the sacred wisdom of the ages, the truths of the universes, ever unfolding and creating. People around the world are connecting with the Diamond energy in many ways as humanity unfolds its heart and evolves at an ever increasing pace. Her passion and purpose is to support you on your journey and uncover for yourself the truth at the heart of your own being. Your diamond journey awaits…. Cynthia has extensive education, training, degrees, and certifications in complementary and alternative medicine. Her educational credentials include: Wellness and Life Coach, Massage Therapist, Flower Essence Practitioner, Wilderness Guide, TFT Trainer, Complimentary and Alternative Medicine Professional, BioAcoustic and EnergyInformatic Research Scientist as well as a Doctored in Divinity. Cynthia will guide you on a wilderness adventure into your heart to discover YOU! Cynthia leads a life of peace and harmony but she says it hasn’t always been that way. Her own story of trauma, illness, unique experiences with frequency and the power of the heart took her on an adventure to become an expert in the harmonics of the heart, HeartMonics™ Harmonize Life!. Has your life transform since a year ago? Are you in harmony with life or are you experiencing disharmony in your heart? Would You Like an Easier Life? And Still be Successful, Happy, and Healthy with a Greater Quality of Living? You CAN have it All. A new perception can harmonize everything! Heart Disease is the #1 killer of both men and women, not cancer! The heart is the central communication center of every single cell in your body and that communications begins from feeling with your heart. Yes, you feel first before you think. There is more…. The heart is your first brain. It is 2/3 neurological cells so really you feel first and thoughts start in your heart and then go to your brain. Everything is heart centered. Did you know the sound of your voice speaks from your heart and is a road map to your wellness? There is more to this fascinating research and science of the heart… I, Cynthia Gardner O’Neill, have developed a fasanating new concept of returning to wholeness through harmonizing your heart. This experiential concept is called “HeartMonics™”. Through harmonizing your heart you can begin to experience a healthy heart creating a healthy mindset to be the life you love as well as love the life you serve. 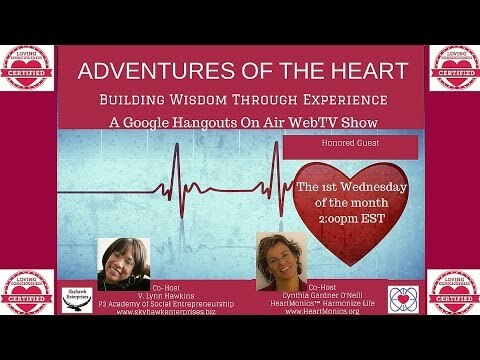 Discover how to harmonize your heart and realign your future increasing your connection to self love and the infinite energy within all life! Defrag Your Heart Drive & HeartMonize! Your heart drive has numerous cells fragmented from conditioned experiences, belief systems, traumas, fear, disaster, illness, disease and lack consciousness. These are collective agreements made only through the persecution of feelings, emotions, and most of all LOVE! Through defragmentation of your heart drive, we as a collective consciousness, begin to Love and resurrect the heart. Through defragging your heart drive you begin to feel again. No feeling, no healing. There are 5 levels of consciousness during this live introduction to ‘Defrag Your Heart Drive From Fragmentation to Wholeness’ you will be illuminated through education and harmonize your life. A healthy heart creates a healthy mindset to be the life you love so you can love the life you serve. This gathering of like hearted people will together be able to create larger regions of open space within your heart. This leads to an open heart and open hearts, open hearts… And so it is! Come join Julie Umpleby of the Diamond Light World and I, Cynthia Gardner O’Neill creator of HeartMonics™, Harmonize Life as we heartmonize the world as one and return us to wholeness! What we are transitioning through as a human race is nothing less than a journey of the soul, the collective initiation into the timeless wisdom and truth of the shaman and the ancient mystery schools . This is ultimately the re-unification of our soul through the primal streams of energy known as Divine Masculine , and the Divine Feminine and the birthing of Divine Child. There is no completeness or wholeness without any one of these aspects, and the acceptance and healing of all of wounded parts is vital for our personal and collective future. What is playing out on the world stage are the wounded soul fragments given free reign to act out their separation from Source because we refuse to accept responsibility for them . Your ultimate peace, abundance and happiness depend on your willingness to heal the respective ruins within you and a stand in the grace , love and power of your fully integrated and authentic self. For each of us this re-unification is happening in various ways and in its own timing right now. For those who have been following the path for many years, we are being graced with opportunities to step ‘over the threshold’ into a fully aligned way of being whereby the eternal Truths become accessible within. In the re-unification, struggle and stress cease, manifestation becomes magical, personal insights and ‘psychic gifts’ enhance – these are ultimately gifts of the soul. For those who are ready, this powerful live introduction to ‘Fragmentation to Wholeness’ will take you to a new level of understanding of who you really are , who you were born to be and to ultimately experience the flow of life and all its treasures through the lens of your soul. It is a gift of Divine healing, alignment , embodiment and manifestation wrapped up with a red ribbon! It is your gift to yourself and ultimately to the world . Come join us as we illuminate through education and take you to new heights of consciousness while opening your heart and realizing who you truly are! If you are ready to defrag your heart drive from fragmentation to wholeness. Are you ready for an easier life? Then take action today!